Our goal is to put a new process in place so we can have a voice in the process and a choice in every election. The Pennsylvania Supreme Court found our current congressional district map unconstitutional on January 22 and ordered that the PA legislature provide a new map for approval by February 9. The legislative leaders immediately requested a stay of that order. That request was denied by Supreme Court Justice Alito on February 5. 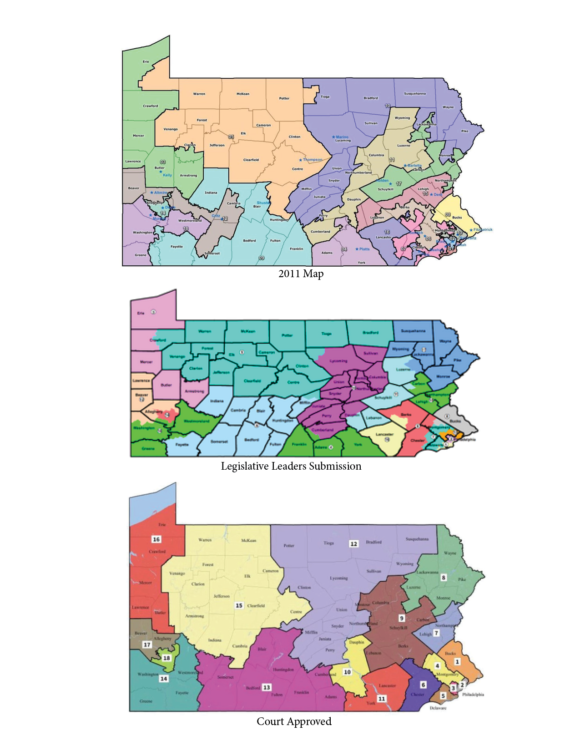 On February 9, after wasting the three weeks given them by the PA high court, legislative leaders offered their own last minute map, a slight tweak on the current map, with most egregious boundaries smoothed but no real attempt to address the extreme imbalance that prompted the League lawsuit. That map was created, as was the last, in a back room without input from public or colleagues. Despite the three weeks given, there was no attempt to include the full legislature in the process or to provide opportunity for consideration, debate or passage. In the following week, various parties offered their own maps. The court’s appointed expert, Nathaniel Persily provided a court-approved map on February 19, the announced deadline for a new map. Our legislative leaders, now joined by 8 Republican Congressmen, are appealing that map to both Federal and US Supreme Court. So far, there has been no stay of the order providing the new map, but a hearing is scheduled in Federal Court, 11:00 a.m. on Friday, March 9, 2018 in Courtroom #2, Ninth Floor, United States Courthouse and Federal Building, 228 Walnut Street, Harrisburg. “The five Justices who signed this order that blatantly and clearly contradicts the plain language of the Pennsylvania Constitution, engaged in misbehavior in office. While the new map divides less counties and provides far more compact districts, no one is quite sure what trade-offs were considered, why splits landed where they did, what other options were considered. Clearly, we need a better process. In all this turmoil, House leaders refuse to acknowledge growing support for House Bill 722, despite 109 cosponsors and repeated requests from constituents and colleagues. But there’s a hint of movement: Senator Folmer, chair of the Senate State Government Committee, has scheduled a hearing for redistricting reform bills, including Senate Bill 22: March 27, at 9:30 am, Hearing Room 1. There’s no easy avenue to reform in PA. No guaranteed roadmap to success. But we have come far further in this effort than anyone could have hoped. And as events unfold, it’s become clear: what happens in PA matters, deeply, to people in gerrymandered states across the country, as they look for ways to reclaim their own right to have their voices heard.